Here is a house that we bet you wish you grew up in. 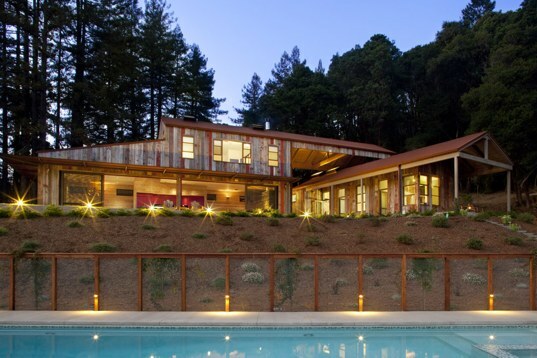 Built for a large family and developed to reduce its environmental footprint, this home feels a lot like summer camp. 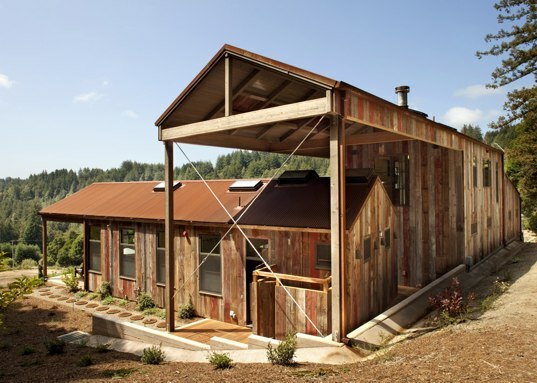 Located on a twenty acre site in a redwood forest, the compound designed by CCS Architecture showcases sustainable building strategies ranging from a solar thermal system, to reclaimed materials, and radiant heating floors, and it has all the features a busy family would need packed into a relatively small footprint. Naturally, it all starts in a fantastic kitchen. 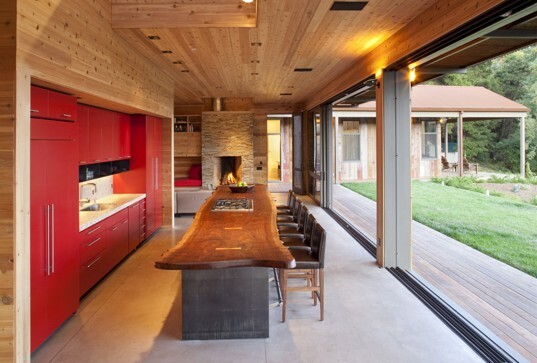 Sited in Aptos, CA near Santa Cruz, the 2,800 square foot main house’s anchoring feature is an 18 ft long single-piece kitchen island reclaimed from a fallen walnut tree. The island sits adjacent to a massive movable glass wall system that opens a full 32 ft, allowing the space to pour into the yard. Clad in reclaimed barn wood and a Corten rusted steel roof, the home soaks in the agreeable California coastal sun and is cooled by the ocean breezes. The home’s unique roof-over-a-roof design makes it feel much larger and protects the connection between the “live” space and the “sleep” space. A solar thermal system helps heat the domestic water, the radiant floor heat, and a pool below. The fun keeps going at the adjacent steel “clubhouse” packed with all the amenities to keep the family busy — that’s if they are not throwing horseshoes, practicing archery, relaxing in the sauna, or walking through the woods.